These days, it seems like you can’t turn around without bumping into news about drones or electric vehicles. 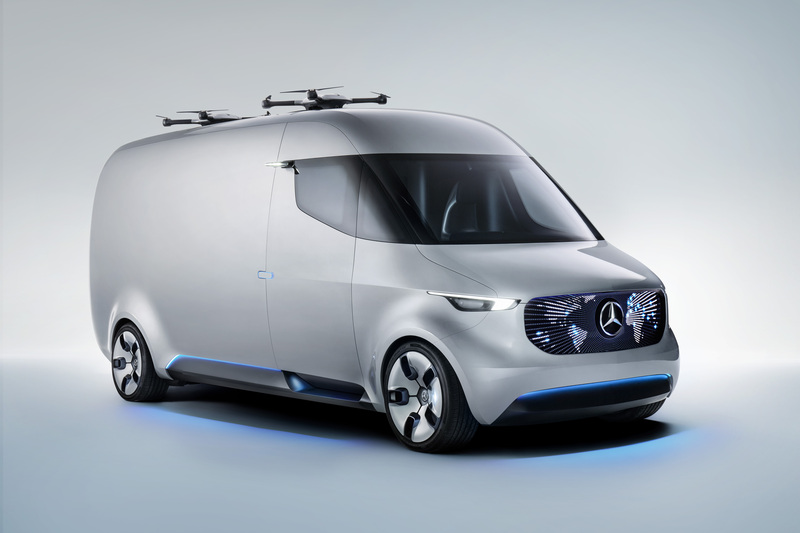 Mercedes has combined those two trendy topics with one vehicle it’s working on: an electric delivery van outfitted with two small pilotless aircraft capable of carrying small items to their final destination. The little automated drones — or “robotic carrier pigeons” as Bloomberg has aptly dubbed them — would be mounted to the roofs of a new line of “Vision Vans” as part of a suite of on-board systems aimed at cutting costs and delivery times in half, Mercedes said at a presentation in Germany today. Each drone can fly with items weighing up to 4.4 pounds as far as six miles, making it easier to drop off items in places that are tough to reach on four wheels. They’re made of carbon fiber and aluminum, and feature four 22-inch propellers. Similar models have already been used to help carry medicine to people in hard-to-reach areas, Mercedes said. When the van pulls up to the vicinity of the delivery, a robotic arm will transfer the parcels to a hatch which opens automatically. The drone then picks up the item, and flies to a landing spot set by the customer. Mercedes hasn’t given a timeline on when the drones or other technologies it’s working on would become commercially available, but says it’s all part of a $562 million investment aimed at speeding up deliveries of online orders.